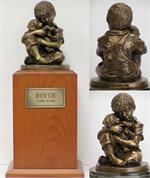 Simply precious, this urn is made of cold cast bronze (polymer with bronze additive) to make it lightweight and economical while resembling a true bronze piece. 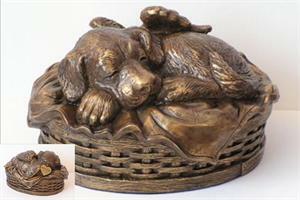 Very unassuming as a pet urn, it evokes memories of both younger days and peaceful moments shared. Comes in four finish choices: Bronze, White, Verdigris and Black. These finishes can be seen by chosing color of choice from dropdown. 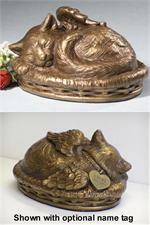 The heart shaped tag on the collar may be optionally engraved to fully personalize the urn. Ashes are loaded through the bottom of the urn. Would you like to add the engraved tag?